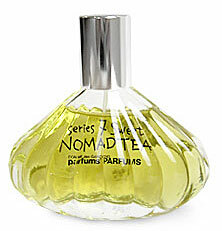 Continuing on my quest to find the perfect tea scent, Nomad Tea by Comme des Garcons popped up as a potential candidate. As far as I understand it, Nomad Tea is a part of Comme des Garcon’s Series 7: Sweet. It, and the fragrances in the collection, are a less complex homage to varying notes. In Bottle: Bitter, dark, herbal tea that has a very distinct bright mint note to it. This reminds me a lot of another mint based fragrance that I did particularly care for. Mint has this repellent quality to me that tends to hover between nicely spicy and rather plastic. I love real mint, but smelling it in fragrances is a real downer for some reason. Applied: Artemesia gives the very powerful mint note a nice mellowing but you can tell the mint is very strong as it fights off the evaporation for a good while before finally giving in. The rest of Nomad Tea is headed by a very nice green tea scent with a smoked quality to it. There’s a very mild sweetness to this followed by the herbal, floral treatment that gives Nomad Tea a very aromatic feel to it. The dry down is a nice smoky and woodsy scent. Extra: Comme des Garcons is a fashion house focusing on avant guard concepts. They branched into fragrances in the early to mid 90s. Design: I’m not wild about the design of the bottle as it seems less polished than a fragrance like this deserves. Held in a textured glass bottle, Nomad Tea has the series name, fragrance name, and house name written in black ink on the glass. Very simple, really boring. Kind of messy which reflects the house’s aim a bit but doesn’t quite make it there. I expected better from Comme des Garcons, to be honest. Notes: Artemisia, wild mint, Burmese green tea, geranium leaf, white sugar loaf, smoked woods. That mint note that opens this is pretty distracting for me. So while the rest of the fragrance’s treatment of green tea is rather interesting with the sweet smokiness creating this nice atmosphere, I still have to get past the dreaded mint. I love mint–when I eat it. I don’t like it in my perfumes for some reason. It just has this watery, spicy, plasticness to it that turns me away. Reviewed in This Post: Nomad Tea, 2009, Sample Vial. This entry was posted in aromatic, comme des garcons, Reviews By House and tagged comme, des, fragrance, garcons, green, nomad, perfume, review, scent, smoke, smoky, tea. Bookmark the permalink.